Outstanding Student Awards honors 22 College of Southern Nevada students for their exceptional academic performances. 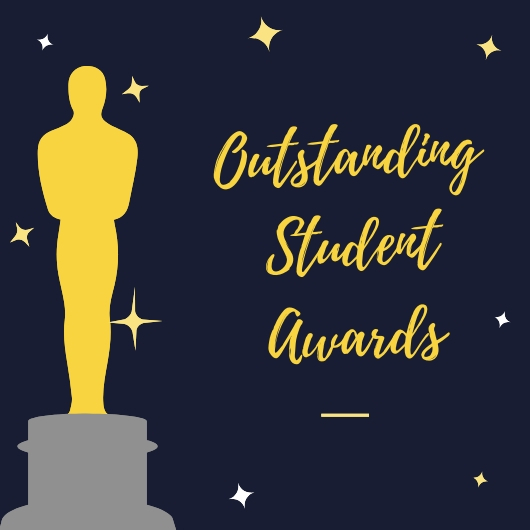 Students winning these awards are nominated annually by each academic department at the College. Faculty vote for students who best represent their departments. Winners receive plaques and awards for their efforts, according to Professor Jennifer Mitchell, who had a couple of her very own journalism students win these awards in the past few years. Families and faculty are there to cheer them on. “By the end of the night, everyone in the room feels uplifted, inspired, encouraged and amazed at the high quality of CSN students,” Mitchell says. One of the student honorees Nicole Xophi Welch, nominated by the Department of Human Behavior, says, “I certainly did not expect to be able to win an award like this. I cried when I finally realized I actually won and everything about this has just been an amazing experience for me.” When she started college she wanted to put everything in to it to be successful and this is a wonderful validation. Welch has complex post-traumatic stress disorder as well as an autoimmune disease called Sjogren’s syndrome making it difficult for her to stay motivated but her efforts and prevalence was quickly noticed and recognized by CSN psychology Professor Elsa Mason. Department of Media Technologies winner Bailey Thurmond is shocked to receive this award. “I am looking forward to having the people who have supported me throughout my educational journey there with me to share this accomplishment,” Mencos says. The most difficult part of Adamyan’s journey during his collegiate studies was balancing a heavy work load. He worked a full-time and part-time job all while attending school. “Pushing myself to my limits has made me realize they aren’t limits. We are all capable of doing so much. I set goals for myself and proceed to exceed my own expectations. This journey has helped me grow and become a person I am proud to be.” Adamyan plans on attending University of Nevada, Las Vegas for his bachelor’s in hospitality after he’s completed his degree at CSN. 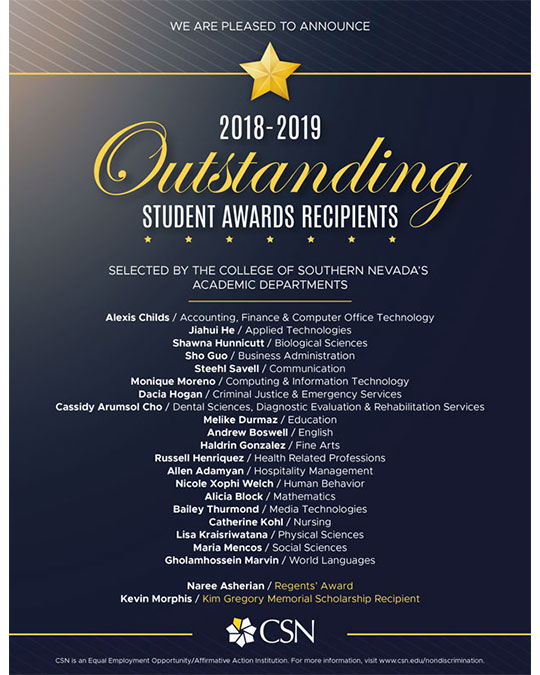 The College community comes together to celebrate these Outstanding Students on Friday, May 3 at 5:30 p.m. in the North Las Vegas campus’ Morse Arberry Jr. Telecommunications Building. It’s open to the public.